Feelings about death are complicated: illogical, guilt-ridden, speculative. We are often shocked by death and deem it unfair, knowing damn well that everyone and everything dies. Nothing is permanent. Look around you. None of what you see will exist forever. Nothing. It goes through constant change, and has a time when it will expire. That change, that progress, cannot be stopped, whether to our bodies or our environment. It is part of evolution, part of the big bang, part of the expansion of the universe. It started long before we got here, and will continue long after we’re gone. Even this planet we inhabit will eventually disappear. Being mindful of this impermanence helps us to appreciate everything more. When my dog died last week – the third time in my life I’ve been through this trauma – it seemed so sudden, and kind of unfair. After the shock, my first feelings were ones of self-examination. Did I miss warning signs? Should I have done something differently? Did I somehow contribute to his death? We want to stop death, even after it happens. These feelings were piggybacking with ones of intense sorrow for my dog and any suffering he endured. But it went further than this. I felt sorry for him for being dead, which makes no sense since he no longer has a consciousness (well, maybe he does, but if so he’s still not likely to be suffering). He presumably can’t feel anything, so there is no need to torture myself over his absence. It is those left behind, the living, who bear the burden of sorrow and suffering, which is somewhat ironic. The dead have the easy part. The living have the hard part. Our wanting to prevent and stop death makes perfect sense – it highlights how much we value life. But life would not be special if it were not for death. Without death, living things would have little challenge, purpose or meaning. Existence must be finite, because we cannot fathom or tolerate the infinite, at least not in our present state. If you knew you were going to live forever in this form, how would you feel about life? Even the optimist may become pessimistic, and the pessimist who used to get up and think “just another day closer to death” may realize that this was actually a good thing. The gradual changes that we and everything around us goes through prepare us for death. Our bodies and faculties start to fail us, and we find that we no longer fit in very well with the world around us. It now belongs to the next generation, and we must move aside for them, just as our ancestors did for us. Premature death is another matter. When one dies early in their lifespan, we feel they have been cheated. Maybe so, maybe not – it depends on what comes after death. I’ve always thought that those who believe in a glorious afterlife should celebrate death, not mourn it. If nothing happens after death, then yes, you could argue that those who don’t live a full lifespan were cheated, but in this particular instance they no longer have a consciousness and aren’t at all aware or affected by this unfairness. If there is consciousness after life, then they weren’t really cheated at all. We were, of having them around. So when someone dies, are we sorry for them, or ourselves? Usually both, but the sorrow for ourselves makes much more sense. But to dwell on “what ifs” and painful moments leading up to a death is unproductive, and a futile attempt by our minds to cheat or reverse death. In some cases death may be delayed, but it cannot be cheated, it cannot be stopped, it cannot be changed, no matter what we do. To have an awareness of missing the deceased because of what they meant to us is much more productive. This is where others can step in to fill the void. Perhaps the animal or person who has passed on has given us new insight, a new outlook, a new opportunity with their passing to make new connections with others. Maybe we take the best in them and incorporate it into ourselves. Maybe we have more patience with the living. Maybe we have a greater appreciation for life in whatever time we have left. So when you do anything in life – listen to music, converse with a friend, go to your job, clean the house, or take out the dog – be mindful of impermanence, and the fact that whatever you’re doing will have an endpoint. If you experience a “bad” thing, know your feelings about it will end, and be glad. If it’s a “good” thing, know the same and thereby appreciate it more. Not taking things for granted will help you be more grounded and live in the moment. Nothing is forever – even grief. My dog died yesterday, and part of me died with him. I never realized how much warmth he added to my life until I had to end his. I never thought about being without him until he suddenly had to leave me. He was pure love; a kind, gentle soul with an endearing personality that you couldn’t help but admire. He was so sensitive that if he picked up on the slightest hint of anger he would leave the room. If I sighed in disgust at something or, god forbid, had an emotional reaction while playing cards (I’m a poor loser), off he’d go. I don’t know how to make sense of my world without him. Yesterday was the hardest day of my life. It was a tough week. Marley’s downward slide started abruptly a few months ago. All along I believed he would get better, or at least not get worse. He had a cancerous growth removed successfully, and was fine afterward. Then, a few weeks later, he started to have trouble walking. A dog of his size who can’t walk is a definite problem. After many tests, the doctors weren’t entirely sure what the trouble was. They put him on medication, and with this he managed to get around alright, with occasional help from me. Some days were better than others. Occasionally we could take our long walks like we used to. He liked that. I’d listen to a Dickens audiobook, and he’d smell everything along our path. There is a big open field down the hill from my house that he loved, and we’d walk up to the gate of the nearby water treatment facility. He would wait at the gate, as if expecting them to let him in. There was a surveillance camera overhead, and I often wondered what anyone watching thought of him standing there. On the way back, he’d insist on lying in a patch of grass to contemplate life, and I had little choice but to join in. It wasn’t my usual style to just be; he had to teach me. A few weeks later he started developing mysterious symptoms that caused him to lose his appetite. More tests, more drugs, more uncertainty. He started to lose weight, the walks became impossible, and he seemed to lose interest in just about everything he formerly enjoyed – rides in the car, trips to Grandma’s, playing with toys, even his favorite food – Frosty Paws frozen dog treats. He had stopped greeting me exuberantly at the door when I’d come home. But after another vet visit and better drugs, I had reason to hope that he’d recover and have some good months left in him (I had at least accepted that he likely wouldn’t have years, yet still avoided thinking that through to the inevitable conclusion that slapped me in the face yesterday). 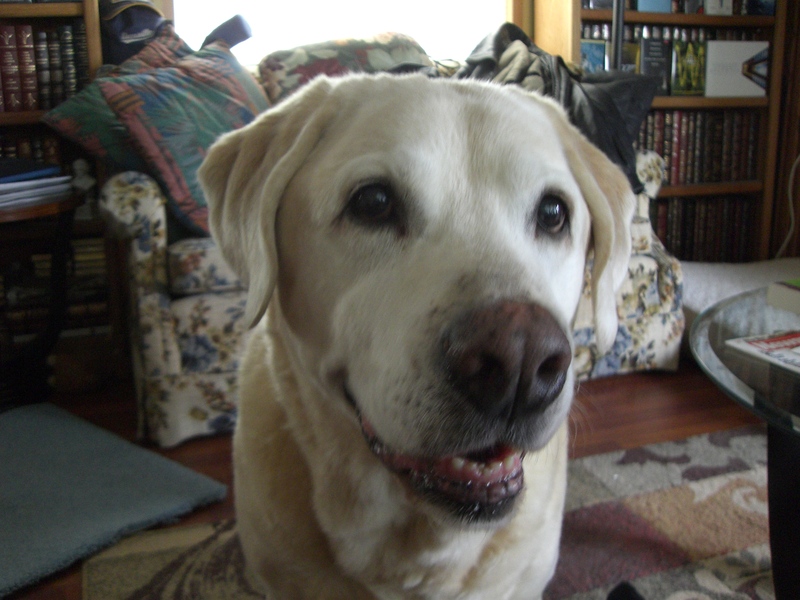 The final week he lost all interest in food, something that, as a Labrador, he always loved. Eventually he wasn’t even interested in water. I couldn’t get him to take his pills. I’d put them in his mouth and hold it shut for a long time, rubbing his throat gently, and he still wouldn’t swallow. I felt awful doing it because it scared him, but I knew he had to take his pills or he’d surely get worse. He spent much of the week crying while I was trying to sleep, and while I was usually able to comfort him, it would begin again an hour or so later. It was unbearable. Part of me felt angry with him because I needed my sleep, but I always had one ear open for his cries because I didn’t want him to be lonely or afraid. I felt guilty for feeling angry. I was frustrated at not being able to help him, even though I had run up over $5000 in medical bills trying to do so. I’m not sure when it occurred to me that he might not recover. 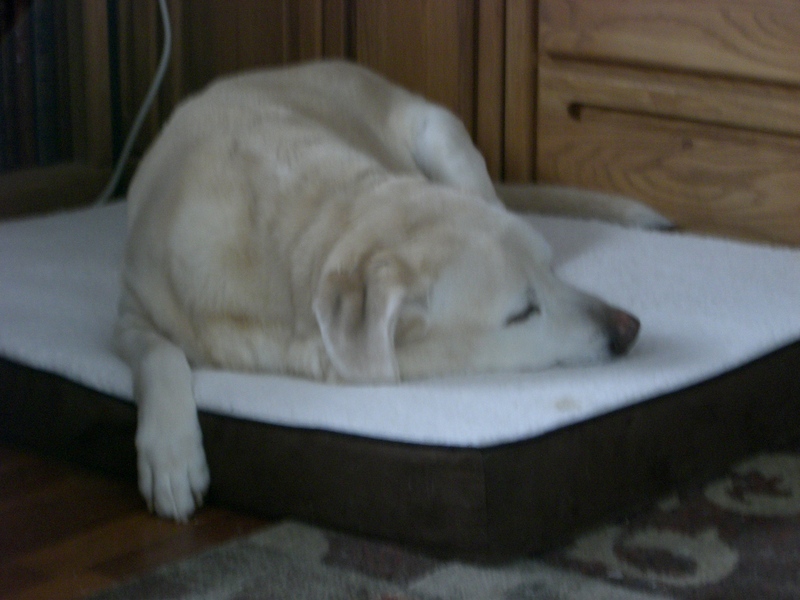 It was somewhere around the last few days when he just didn’t seem interested in living any longer. His eyes looked distant, pained. He wasn’t the same dog I knew. Something had stolen that dog from me, and I was left with the poor, fragile, tormented soul before me. He looked so sad. We said our goodbyes many times those last few days. When I left for work at night, I was never sure what I’d find when I got home in the morning. That last night I cried on the way to work as Barry Manilow crooned on my stereo: “This one’s for you wherever you are / to say that nothing’s been the same since we’ve been apart . . .” I commented to coworkers that I was afraid he’d be dead when I got home in the morning. But when I opened the door apprehensively, I was relieved to see that he had hung on, perhaps just for me to get there. It was his last day on Earth. His breathing was heavy and he looked distressed, sitting in the middle of the living room and panting. It was Friday, and I knew my regular vet would be unavailable over the weekend. I couldn’t bear to see him suffer any longer. I was being selfish, keeping him alive for me. There was no hope. He was giving up, and I finally had to also. I made the decision I thought I could never make. When I phoned the vet, I opened my mouth but no sound came out. When I finally found my voice after a long pause, they understood instantly. Was 1:30 OK? Three last hours together. There’s something very unnerving about a scheduled death, and I couldn’t help but think of a prisoner execution. The only thing that kept me from feeling like a creep was his very palpable suffering. I couldn’t bear to see him in pain. I tried to comfort him in those last hours. I said more goodbyes that felt real this time. I thanked him for loving me when I wasn’t so lovable; for always forgiving my faults; for teaching me to be more human, to care for someone and something. I had named him Marley for this very reason – Jacob Marley fulfilled the same role for Ebeneezer Scrooge. While I wasn’t as miserable as that fictional character, I definitely needed some warming up. I told him what a great dog he’d been, and that we would all be following him soon. In fact, my one comfort was in knowing that we are all going to die, which made Marley’s death seem less unfair. It was just an issue of timing. We all have our turn at bat, but no one can stay on the bench when it’s time to go. It was the hottest day of the summer as we left the house together for the last time. Getting him in the car was very difficult, both physically and emotionally. I was afraid I’d hurt him, which, in hindsight, was a rather unnecessary concern. I wanted him to be comfortable, yet the heat was no doubt adding to his discomfort. Jekyll and Hyde personae argued in my head: “You’re killing your dog!”; “No, you’re doing the hardest thing that love demands – letting go.” It was only a few minutes to the vet’s, and I wasn’t sure if that was a good thing or bad. As I was driving, I tilted my rearview mirror, knowing that spot – his spot, the entire back of my SUV – would soon be empty. Gone were the days when he would be standing right there over my shoulder, looking eagerly out the front window. It was starting to sink in that I would never see him again. Thoughts ran through my mind of when I first chose Marley. My friend and I were giving him the “dominance” test, turning him over on his back to see if he would tolerate a submissive posture (he did). The old 50s song “Walk Like a Man” was playing on the radio. I sang along to the high-pitched refrain, and whenever I did, Marley immediately stopped exploring and cocked his head to the side as if trying to understand me. That sealed the deal. Once we arrived at the vet’s, the tech, Kathy, helped me get him out of the car. We took him to relieve himself (again, perhaps pointless, but it seemed important to me), where he promptly peed on my shoe because he couldn’t stand up. Normally fastidious, I didn’t care. When we got him inside, we went right to a room we had been in many times before, where they spread out a blanket for him. He was lying in the “play bow” position, with his front paws straight out in front of him. As the tech wrapped the catheter around his left paw with surgical tape decorated in whimsical pawprints, I saw that she was crying. As hard as this was for me, I wouldn’t want her job. How I got through the next ten minutes, I don’t know. It had to be my concern for him, that he not suffer any more. I tried to get him to look into my eyes, to connect, but he was too distressed. I felt helpless, and that he didn’t know I was there. When the vet came in, she assured me I was doing the right thing and explained to me what would happen. She would give him a sedative first to calm him down, then a heavy dose of anesthesia, which would end his life. There might be involuntary muscle movement, but this does not indicate suffering. His bowels may let go. His eyes would probably not shut. Did I want her to shave off some fur as a memento? Any particular spot? I was allowed to stay in the room for as long as I wanted. The quiet was deafening. I put my hands on his head and held them there for a while, a final transfer of love and energy, a recognition of what he had meant to me, and hopefully I to him. I kissed the top of his head. I didn’t know what else to do. I’d have stayed longer, but the stillness was too upsetting. My dog had left me, and now I had to leave him. I picked up his suddenly useless leash and pelt of fur, and left the room alone. Why do we have to die, I asked myself. Flowers, people, helpless animals. Is it because this forces us to appreciate them, to appreciate life? Would eternal life engender familiarity, boredom, even callousness? Would everything then have no meaning? Is that any way to live? My favorite movie is Shadowlands, starring Anthony Hopkins as C.S. Lewis, the real-life Christian apologist – one who attempts to explain why God allows suffering in the world. Lewis gives fancy speeches on how suffering is God’s wake-up call to an unappreciative world, but he never really experiences suffering personally. Then he falls in love with an unconventional woman who opens him up to life and love, only to lose her to cancer. He is beside himself with grief. She tells him that “the pain now is part of the happiness then” – that love always brings pain in the end. You can’t have one without the other. It’s part of the deal. To avoid pain, we attempt to live in the “shadowlands,” a fantasy future, always hoping for the next best thing around the bend but never really experiencing the present. A life wasted in anticipation. Thoreau put it this way, saying he wished to avoid, “when I come to die, to discover that I had not lived.” Death is part of life. Without it, life would lose all purpose. We don’t want it to end, but it must. Eckhart Tolle, when asked the meaning of life, said that life has no meaning. We bring meaning to it. Marley knew how to live. He didn’t dwell in the shadowlands, but always stopped to smell the roses. He knew that the best things in life are not a good job, a fancy car, or a big house. They’re the simple things: going for long walks, lying in the grass on a sunny day, being exuberant about life and people, good times with friends, getting lots of rest, being endlessly curious; always forgiving wrongs, always extending the benefit of the doubt; remembering that life is short and you must live and love while you can – savoring the moments, because everything will surely pass away. Didn’t the Spirits warn Scrooge of this? Accountants talk of business entities as “going concerns,” meaning there is an assumption that the business will continue for the foreseeable future. Life, however, should not be viewed as a going concern, but a temporary one. It will end, and should therefore be enjoyed while it lasts. It has been my long habit to dwell on past woes and thereby not enjoy life out of distrust for its pesky unpredictability. It’s not going to catch me with my guard down. Marley tried to teach me otherwise, both in life and death. This is his legacy, his gift to me. I will miss him. We were constant companions for eleven years, sharing the tears and the laughter. He used to come to work with me every day, and all my customers knew him. This morning, I came home to an empty house strewn with evidence of his former dominion here: the toys, the uneaten bowl of food, the phone message saying his prescription is ready. Caring for him this last week had bonded us even further, and I was beginning to think I was getting good at it – so much so that many times this morning I forgot that he wasn’t here. I still expect him to come up to me with that eager, expectant look he got whenever he wanted something. Sometimes, before he got ill, I made him wait if I was busy, but now I’d give anything for his chin on my leg and that look of innocent expectation. I was closer to Marley than I have been to any human being. As a card-carrying introvert I was never very good at relationships, but with dogs you don’t have to compromise on where to go, what to do, or negotiate space needs. You have all the control. This works for me, but you can’t practice it on people. I’ve tried. It’s not even very fair to dogs, but they are long-suffering and adaptable. 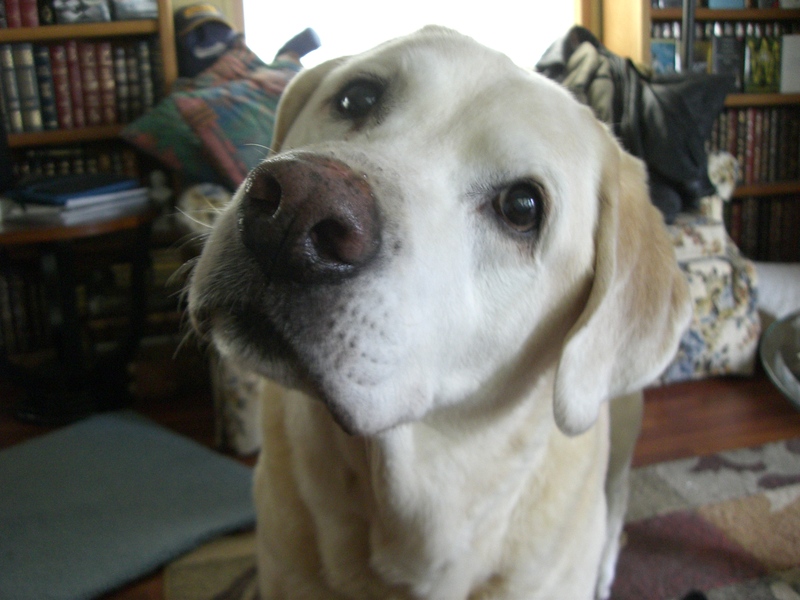 I did eventually learn to surrender to Marley’s needs and abandon my selfishness, because I loved him (and, honestly, who can turn away such pure enthusiasm?). When he wanted to go for walks in the morning after his night of sleeping and my long night of third-shift work, I took him. In spite of my weariness, his need seemed quite reasonable and I came to enjoy fulfilling it for him. This shows signs of sacrifice and selflessness for someone you love. Marley knew there was hope for me yet. Some of Marley’s ashes will be sprinkled in the field he loved to explore.